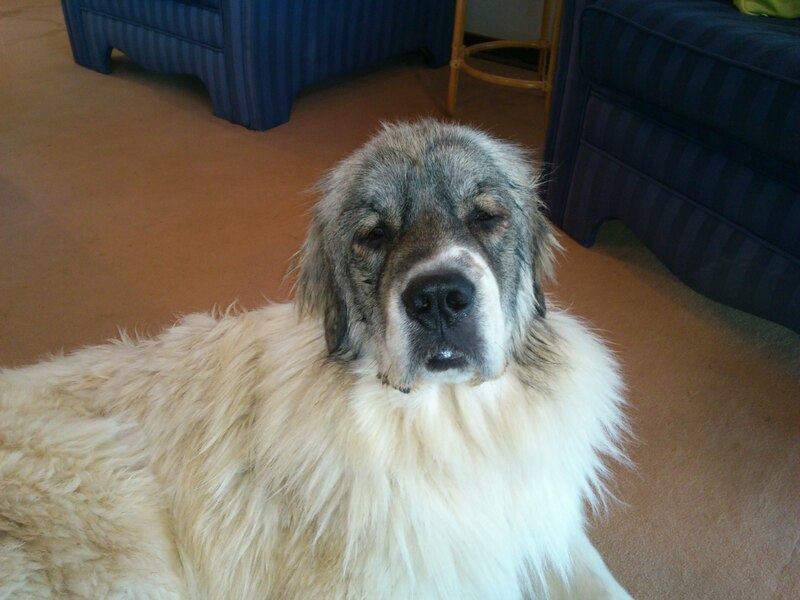 Kobus arrived with yet another stray dog – this time a beautiful girl, whom we’ll call Lady – a St Bernard!! He woke me early on Saturday morning, after he left before the first cockerel‘s announcement that day is coming, to go to the Senekal farms in the Eastern Free State. As most of you will know, when you then doze off after such an early wake, especially when the hot blanket is on and you are cuckooned in a snug bed, you sleep the sleep of the dead!! So when the phone rang, he caught me in this half-dead state, and at first I don’t think the point sank in – he had picked up another stray. When I finally woke up properly, I called him back to re-hear the news. And yes, true to my man, he had a half-frozen dog snuggled up into his lap in the pick-up, after initially loading her on the back, and then coming to his senses to rather put her in the cab with him, heater on. So I waited the whole day to greet and meet the latest addition to the family. But o my goodness, when she finally arrived with him, my heart sank in my shoes, as she is BIG, she was dirty, and she was ON HEAT!!! We had a very uncomfortable evening – I was miserable, he was sorry that he did not have the heart to leave her there. See, it seems she was dumped right there next to the road, probably because she was on heat, and left to fend for herself. There were no signs of possible owner homes in the near vicinity. 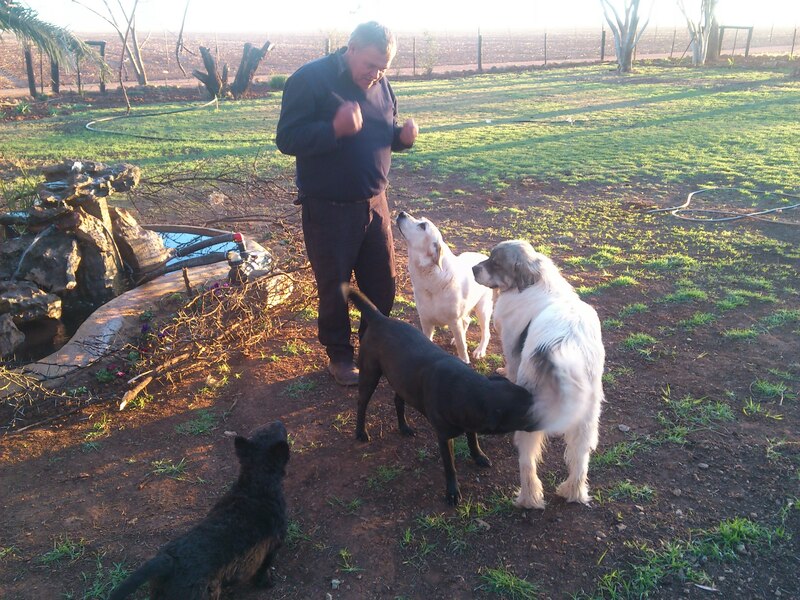 Unfortunately, when Kobus drove past in the dark of the morning, he glimpsed the white furball on the side of the road. Looking back into his rea-view mirror, he then saw another figure of an Alsatian, also snow white, sitting into the curled up body of the bigger dog. Thinking the big dog was possibly hit by a passing car in the night, Kobus turned around. When he got closer, the poor Alsatian ran off into the dark, but the St Bernard came straight up to the opening car door and lifted her paw onto his lap. He says he was in tears, but that is my man! Yesterday morning arrived too beautiful for words after some hectic wind storms this past week, so my spirits were higher. By last night we had decided to have her spayed this morning, especially since the local vet ran a special on what otherwise becomes an expensive exercise. So we withheld food, phoned all the police stations in the towns near her pick-up point, and with no owners found, I took her in for spaying this morning. The vet and his staff fell in love with her instantly, apparently she is only about a year old, she is thin, but will probably become a show piece once she is healthy and has added weight. Poor Buster, the last stray we adopted about 4 months ago, thought he had died and gone to heaven this whole weekend since she arrived. You see, with her on heat, even though he was neutered soon after we got him, he tried for dear life to mount her incessantly! Shooting blanks and all, glazed eyes, but with pure love / lust in his eyes. Right now, she is lying in a shady spot on the porch, still very much doped, with Buster lying a few metres away, keeping a tender-loving eye on his beloved. This entry was posted in Love and Life and tagged Dog, neuter, Senekal. Bookmark the permalink. 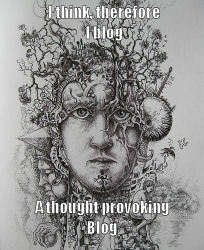 Sorry for the delay in commenting. You have a beautiful family of animals. I also enjoy your SA terms. I’ll have the lingo down in no time.